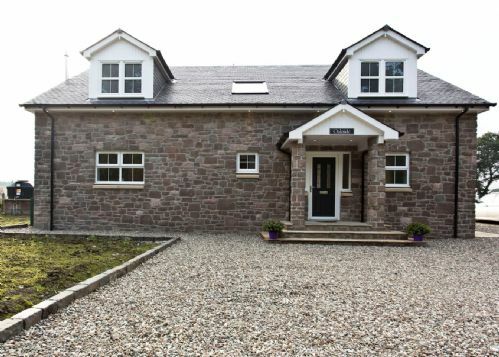 Oakside is a 4 bedroom new build house in a rural setting just outside Stirling. It has been furnished to a high standard with an oil fired AGA cooker in its fully fitted kitchen and a wood burning stove in the living area for the colder nights. It can comfortably sleep 8 plus a baby in cot but possibly more by prior arrangement with owners. The rental of this house includes all linen, towels, Wi Fi, Sky TV, logs for wood burner, heating, electricity and barbeque. 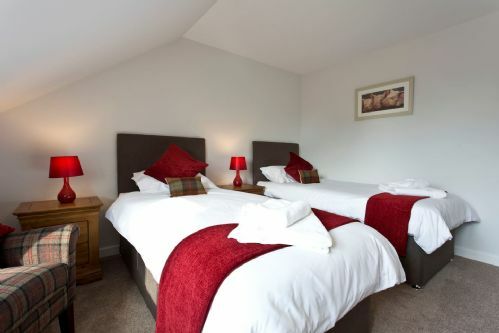 Oakside is within walking distance of the Blairdrummond Safari Park and Briarlands Fun Yard. It also has excellent motor way links to get you to Edinburgh, Glasgow and Perth . 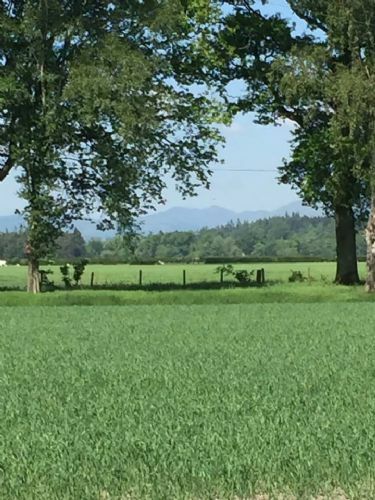 Beautiful house in a great location for Stirling, the Trossachs and easy access to Glasgow, Edinburgh or Perth. We'll equipped and great starter amenities. Very helpful owner made booking easy and was happy to answer our questions. Cannot thank Catriona enough for making our stay at her beautiful property so enjoyable. 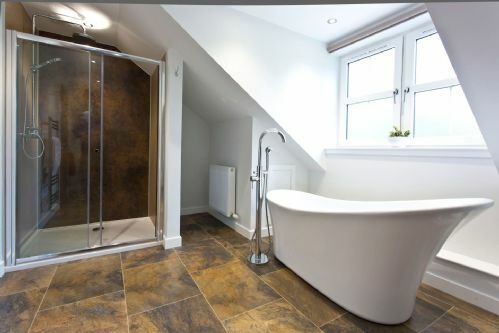 It is a lovely cottage finished to very high standards and was impeccably clean. We very much hope to be back in the future. 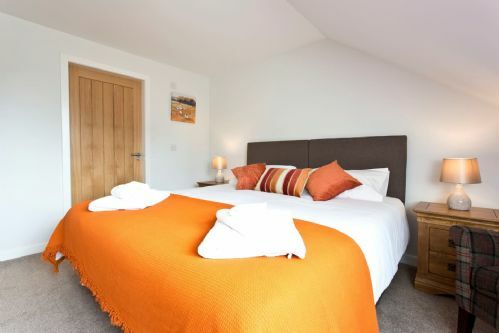 We booked Oakside for my Mum’s surprise 60th birthday weekend, and I’m so glad we did, as we couldn’t have asked for a nicer host, better accommodation or location to commemorate such a special birthday. 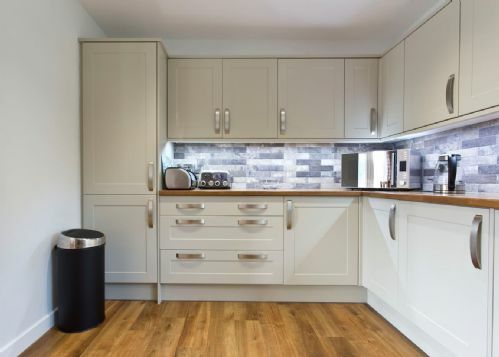 Catriona was so helpful, knowledgeable and accommodating from the moment I contacted her to check availability, through to meeting her when she welcomed us to Oakside and talked us through how to use the heating, aga etc. Oakside is just gorgeous and I can’t recommend it highly enough. 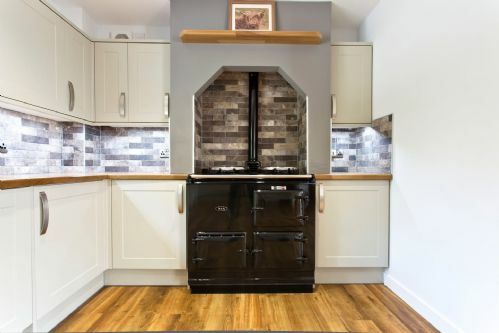 It’s a beautiful cottage finished to a really high standard, whilst maintaining a cosy homely feel. Oakside easily accommodated the eight adults and two year old in my party, as it is so spacious with generous sized bedrooms and huge bathrooms. 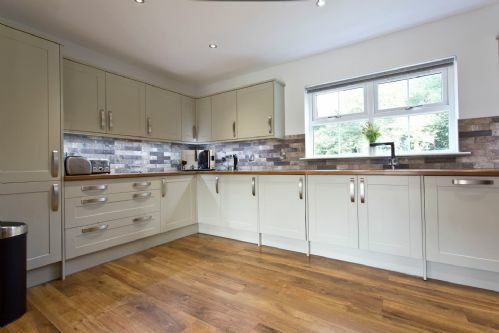 The open plan kitchen, dining and living room was just perfect for my family to relax over the course of the weekend. There’s loads of space outside too with a lovely patio area that overlooks the hills and local scenery. Bliss. We chose Oakside as it’s located just a couple of minutes drive from Blair Drummond Safari Park - which was a great day out. An unexpected treat was a trip to Briarlands Farm (just down the road) as Catriona mentioned one of the pigs had just had 14 gorgeous piglets the previous day. My two year old nephew loved the farm, especially the tractor ride. Oakside, its furnishings, equipment - including the wonderful Aga - and views were absolutely fabulous. We all loved it and wished we could have stayed longer. 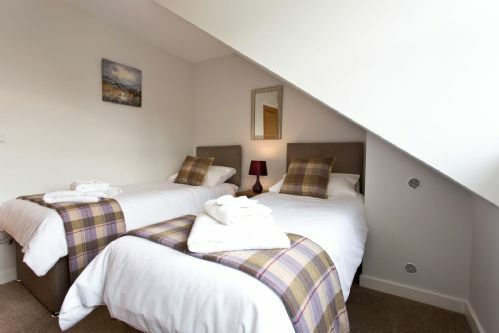 It is perfectly situated for Blair Drummond Safari Park, Briarlands, Doune Castle and Stirling. Catriona was so welcoming and helpful. Oakside was the perfect home base for us in Scotland. We were able to travel all over and have a wonderful home to come back and have dinner each night in comfort or a gorgeous cottage. Oakside was spacious and had all the finishing touches. Hosts were wonderful and provided information on many activities and recommendations on restaurants close by. We would definitely stay again. Days spent relaxing in lounge were a delight. Found this property by chance on Air bNb and contacted owners direct who could not have been more helpful. Absolutely stunning property with all mod cons and a fabulous hot tub awaits outside, perfect when we were surrounded by snow! Perfect location for exploring beautiful Scotland. Also ideally suited for a wheelchair user too as lots of thought has gone into the layout for this purpose. The owners were warm and welcoming and always at the end of a phone if needed. Would not hesitate in coming back. We thoroughly enjoyed our week here. Thankyou! Thank you so much for your lovely review. So glad you and the family enjoyed the house and the area. It really is a pleasure meeting all our holiday guests so don't see it as a job. We would be delighted to welcome you back anytime and of course come direct for the best price. Thanks again, your review is most appreciated and it will give others confidence when booking. 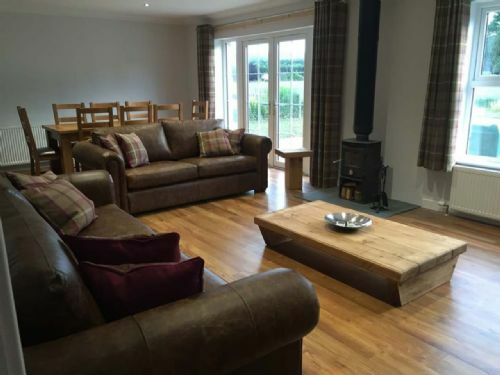 A beautiful, well appointed holiday cottage in a great location for exploring the area. We would definitely go back! Thank you both for such a lovely review and we would be delighted to have you back anytime you wish to come. Hopefully not so much snow the next time. A memorable new year in a superb location! A group of 8 of us stayed over at Carrat Farm between Christmas and New Year. Catriona and David were incredibly helpful and accommodating, couldn't have asked for anything more from them. They met us upon arrival (albeit we arrived late) and showed us round and showed us how everything worked. The kitchen is brilliantly equipped and the AGA is wonderful. 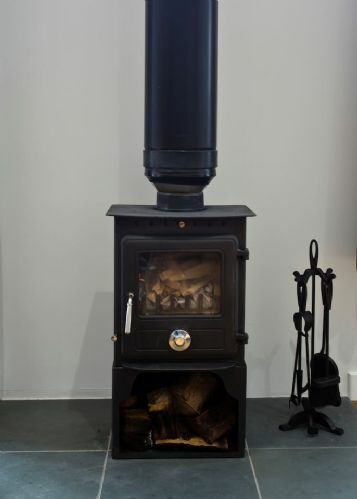 We didn't get a chance to use the woodburner but it looked delightful. The hot tub was lovely after a day out in the Trossachs! The family bathroom is gigantic and we loved the shower and bath! The rooms are all very well sized and well equipped. The WiFi works well and the lounge is very well sized. The views from the windows in the morning of the Trossachs were incredible! Within a short distance of Stirling and the local amenities and Blair Drummond is round the corner. Within 45 minutes of Edinburgh and Glasgow. Well worth visiting and can't wait to return, thanks to Catriona and David for hosting us! Great having you all to stay. Was our pleasure to have you and we very much hope you will come again. 'Extraordinary' would sum up our experience. Please read all of it. The very first time you see Oakside and its location, you anticipate the great time you're going to spend there. You enter this very cozy, tidy, clean and aesthetically pleasing home and, seeing how every detail is on point, you instantly realise the hard work and passion that the owners put into making it so great. They are also very friendly and helpful and they are there for you no matter your needs. Speaking about needs, this place is made to meet any you may have. The kitchen is every family's dream as both in design and utility. That's also the place where you find the welcoming pack. (Yes! They have that too!). The living room is large with cozy couches which makes it the perfect place to spend time with family and friends. Being there for Christmas, we also found a Christmas tree, the best present for our family. The outdoor hot tub is awesome, we even used it during rain. Nothing could hold you back from taking a long hot steamy soak. OK, now stop reading my extraordinary experience and book it, you can thank me later. P.S. : They changed the 'customer care' into 'customer spoil'! Perfect. Will hopefully be back! This was a great find for our family. 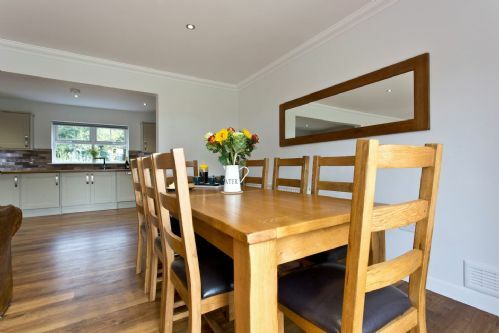 Immaculate house, hotel standard bedrooms and bathrooms, the host could’nt be more helpful. 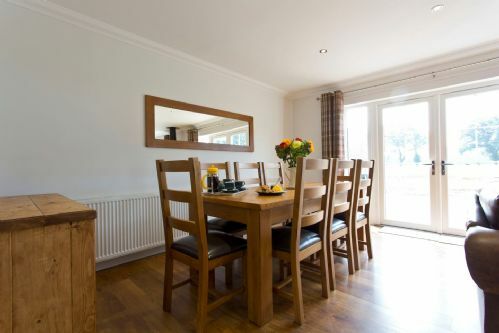 Warm and cosy yet spacious enough for large gatherings, and suitable for a wheelchair user too. Loved cooking on the Aga, but lots of local options for dining out too. Thank you so much for taking the time to review Oakside Barbara. It was a pleasure to meet you and your family and you were perfect house guests. Would be delighted to welcome you back anytime. We booked Oakside for my sister’s 50th birthday celebration. We couldn’t have been more comfortable and relaxed. Plenty facilities for our group and we kept warm on a crisp November weekend in the hot tub. This was maintained daily. Beautiful Denby crockery and bedrooms were delightful. Woodland walks were unbelievable with company of red squirrels and deer. We will certainly return ! Thank you for lovely welcome. We will rent again as long as its available . Thank you so much for the kind review. We are very glad you found the house enjoyable with everything you needed. You and the family would most welcome back anytime. Thank you once again. We had a lovely family holiday at Oakside. The property was in pristine condition and the owner, Catriona went out of her way to make sure we had everything we needed. There was lots to see and do in the area - for all age groups and we found Oakside a very relaxing base. We were drawn to Stirling due to its central location in Scotland, with access to Edinburgh, Glasgow, the Highlands, and the lake region within an hour drive. We couldn't have been more happy than staying at Oakside with Catriona as our ultimate self-catering hostess. Not only was Catriona warm and inviting, but the property matched her personality. Rarely does one find a vacation rental that is brand new and maintained to impeccable standards. If visiting Scotland, stay at Oakside and enjoy the peaceful solitude at a well-appointed property in the middle of all Scotland has to offer! Great family home, lots of space, warm, clean and hot tub! Me and the extended family had a great vacation/holiday here. It's such a great location. Off the main A84 road so its really quiet, but still close to Stirling and an excellent base to explorer Scotland. The Hot tub and back patio with BBQ were well used in the afternoons/evenings (weather permitting). The house was large and spacious. It comfortably fitted, 6 adults, 2 children and 1 baby with ease. Catriona and David were great hosts. They let us get on with our holiday and only stopped by, initially to introduce themselves and show us the house, and then only when we needed something. Very prompt, attentive and gracious hosts. I would highly recommend Oakside Cottage to anyone. A fantastic, relaxing girl's weekend!! We booked a weekend stay for our friend who is getting married soon. We live locally, and all have small kids so the location for us was amazing as it felt like we were miles away but in reality we were only up the road. The location is ideal for visitors to the area. 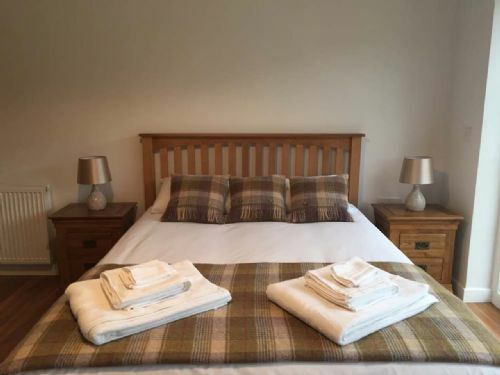 The house itself is beautifully kitted out and provides every you need for a relaxing stay. The hot tub was AMAZING. Would definitely book again for a special occasion, even though we are local!! Cant recommend enough. Thank you for a lovely, relaxing, child free girls weekend!! We had excellent contact with very friendly Catriona for any queries and help we might have needed. The rooms were spacious and there was seating for all 9 0f us to be together. The hot tub was a wonderful asset for all age groups. It was interesting to be in a genuine rural farming area. The close access to lots of activities was very useful. We have a brilliant day at the safari park which, again, was of interest to all age groups. It was nice to have tea and coffee facilities and the special cava treat. Catriona has also been available easily to finish our paperwork since we got back.